I feel it is hard to put into words the influence the Baco crew have had on the BMX world, and especially the flatland world. Pre internet days where print and videos such as the Baco and Dorkin’ series were essentially like bibles for every flatlanders, for tis reason footage remained golden until its dropped in your VCR. The most immediate that comes to my mind, In the modern day you can see the influence Chad Degroot’s riding in the Baco videos inspired a number of generations in the japanese scene. Especially back wheel riding! But the influence goes way beyond that, how people dressed, the music people listened to, and of course the tricks people learnt. The thing about Baco that stood out to most might be the most simple thing, the whole crew had FUN on their bikes. And more importantly were themselves on their bikes, all too often in the modern era you can see riders trying to be something they are not. So many characters throughout the whole movie. This huge part of BMX seems to have crawled underneath a rock, maybe this is the video to bring that out! As much as things change in BMX, the fundamental stays the same. The message to me was clear as I started watching Baco Push it to 11, all the memories came flooding back. The bottles being thrown off the bridge, Chad lacing killer combos in girls dresses, was Mark Hilson gay? Dylan’s crazy back wheel pedal combos, and possibly my favourite Dylan Worsley clip, when he is in a caboose and knocks crisps out of his hands with his bars as he rides out. The riding because the crew had so much fun, brought their own flavour hasn’t really dated at all, which is testament to what the Baco crew achieved. Another big factor that is often overlooked, BMX! 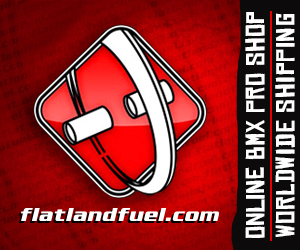 It’s all here, and flatland can mix with park, street, dirt, vert, it’s all towards the same goal of having fun. The great thing about the Blu Ray disc, is the amount of footage that can be loaded on it, the extra section is absolutely amazing. I have still yet to find the hidden video, I’m guessing it’s Baco Uncut? Baco Push it to 11 is an absolute Must Watch! And one for the collector, I know I will watch this back in years to come, laugh and smile. This entry was posted in Exclusives, Reviews and tagged Review: Baco Push it to 11 by Effraim. Bookmark the permalink. Style cats!? That video was the WORST!!! Can I pay extra for a copy w/”uncut” as the hidden video? You nailed it with this comment, E!